After a long, hard bouldering session your first thoughts are to kick back, relax and get a bite to eat, maybe a drink or two. But where do you go? Below are our favourite local places all within walking distance to us. The Black Dog Freehouse is an award-winning pub on Spring Gardens, Vauxhall. They offer rotating Cask-Marque accredited real ales, World & craft lagers, a thoughtful wine list and fantastic food using fresh, seasonal ingredients. 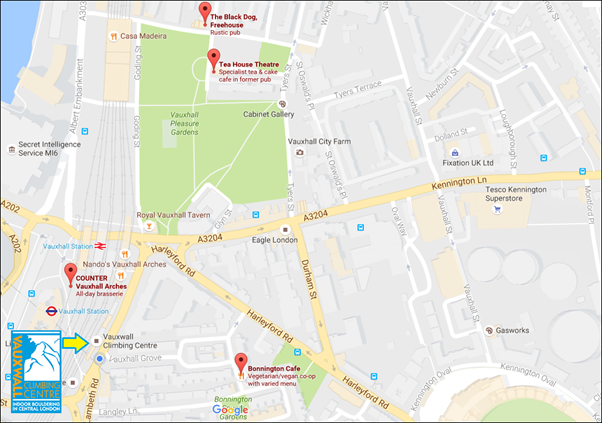 The Tea House Theatre is a laid back, care-free tea house next to the Vauxhall Pleasure Gardens. They offer loose teas, proper sandwiches and homemade cakes and “the best full English breakfast in London”. They do not rush you and expect time to be taken over everything so offer books and board games on-site to encourage you to relax and slow down. Officially London’s longest restaurant housed in a 200-foot long arch (which could easily accommodate Nelson’s Column), Counter is the all-day bar & brasserie where Manhattan emerges in Vauxhall. This 175-cover restaurant serves up freshly made (and seasonal) French and American inspired main courses and hot breakfast meals. Also check out Counter’s carefully curated wine list, comprised exclusively of French and American wines, as well as an extensive selection of laid-back craft beers to quench the thirstiest of mouths. With Cabaret and Jazz nights, Counter is an all-day, all-round place to enjoy any time, night or day. The Bonnington Café is a co-operatively run vegetarian and vegan restaurant in the Bonnington Square Community Centre in the heart of Vauxhall. One of South London’s best-kept secrets tucked amidst the beautiful community gardens of the square, no single person runs the restaurant, rather it’s maintained by an active collective of member cooks who are from all over the world. As a result the menu will be different on any given night. From Japanese to Medieval inspired; and from new Italian and French to new American…each cook brings their own style and background to the Café’s veggie fare.